Over at Julie's: The Worst Job in the House! What job in the house makes you cringe when you think about taking it on? For me it's "cleaning the refrigerator"! I've been watching old reruns of DINOSAURS. Do you remember the critters (their living meats) who live in the refrigerator? Their furry hands are always reaching out to grab whatever is going into the fridge and handing out foods when the fridge is opened. In one episode the rotting, and overlooked foods lured the Baby over and took him captive while Charlene was supposed to be watching the Baby! I don't think my fridge has gotten to that point yet, but close! In my defense: I do have a valid excuse for not cleaning my fridge sooner, I've been reconfiguring my raised garden beds, planting my fall garden, putting in 3 new wild flower beds, trimming roses and bushes, doing laundry, cooking, baking, cleaning house, cleaning 4 parrot cages, harvesting herbs, working on Christmas gifts, blogging and photographing my foods for Over at Julie's, playing Words with Friends, trying to teach myself how to crochet left handed, you know, living life . . but Yikes!!! It was getting ridiculous! I'd look in the fridge, sigh, and close the door! 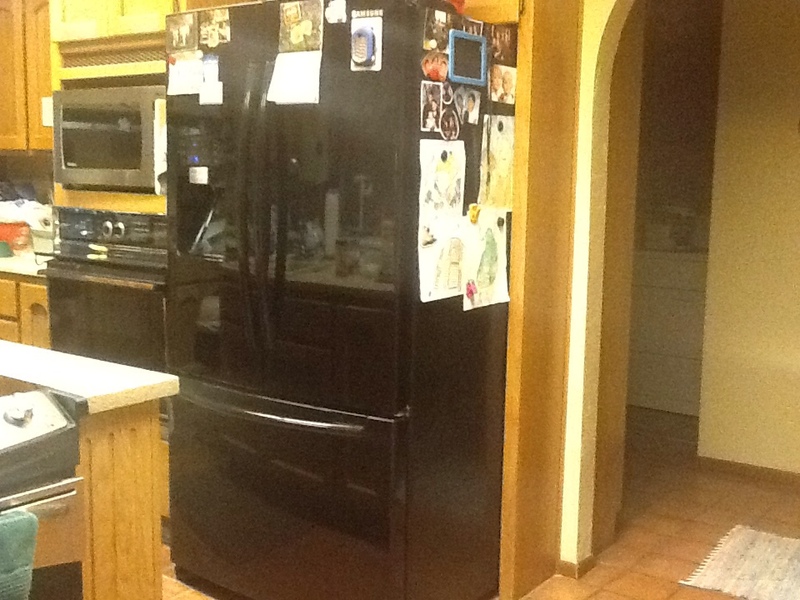 It's harder to motivate yourself to clean something that's hidden behind closed (refrigerator) doors! You never know what lurks behind closed doors! I knew it was going to take a good 3 to 4 hours to do the job right. So, I made a deal with myself . . . I would start! I'd begin at the top and clean 1 shelf a day until it, and the items on said shelf, were thoroughly cleaned with hot soapy water, and/or thrown away if outdated. Once motivated, I ended up thoroughly cleaning 2 whole shelves my first day! Woo-hoo! I'm on a roll and gathering momentum! 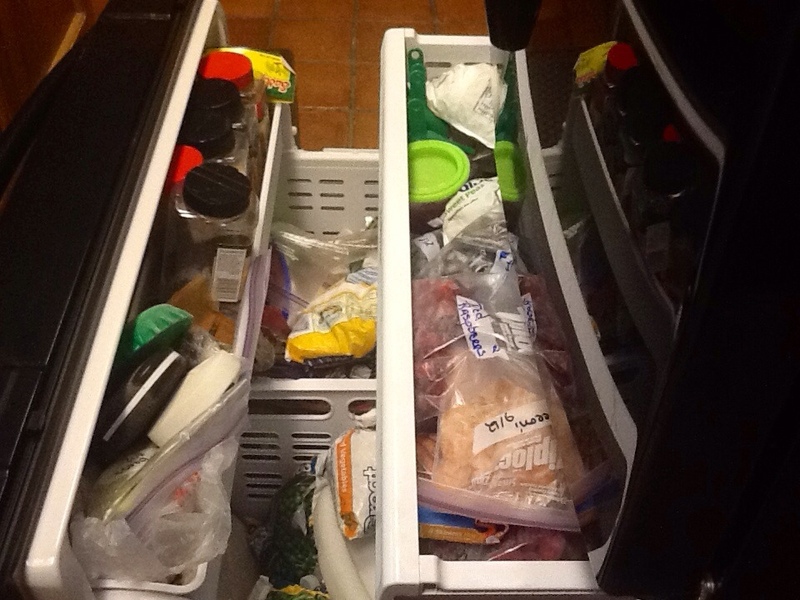 I am really dreading digging through those crisper drawers! Note to self : You've just gotta start, if you're ever gonna finish a job or project! I have a French door fridge with a pull-out bottom freezer that's loaded with mostly frozen fruits and veggies, but it's a mess too! If I keep to my plan and take on the bottom shelf tomorrow, then the 3 drawers, then the doors, the freezer and finally cleaning the dust out of the fins under the fridge, moving the fridge and cleaning behind it, I should have it thoroughly and completely clean in less than a week! 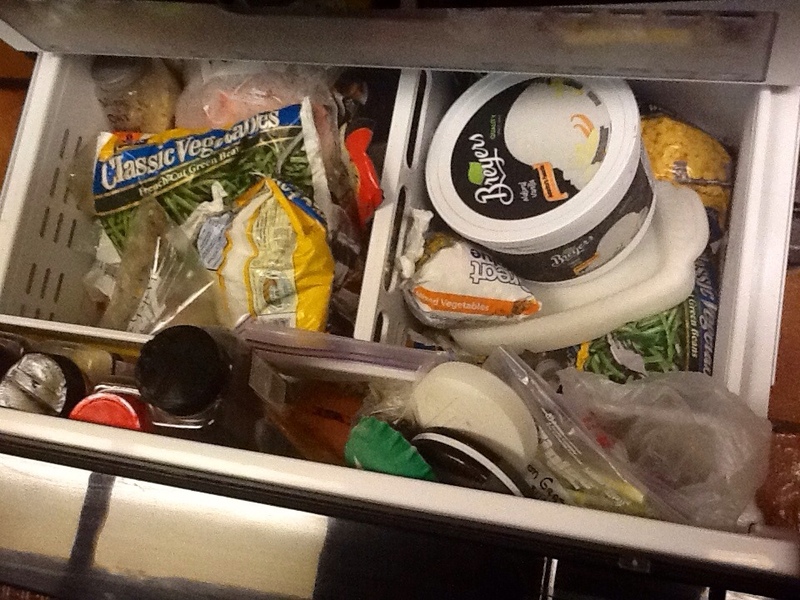 This is where all my frozen fruits/veggies, the parrots veggies, ice cream, little bits of tomato paste, poppy, sesame, and caraway seeds, my blue ices, a hunk of raw ginger, frozen coffee ice cubes for my homemade mocha frappes, and small portions of meat are kept. It's a mess right now! The deep, bottomless drawer is really in need of a thorough cleaning! Next, I'll conquer the 2 upright freezers! And then, the garage! What project have you been putting off doing? I challenge you to start! If it's the refrigerator, join me by taking it 1 shelf at a time! 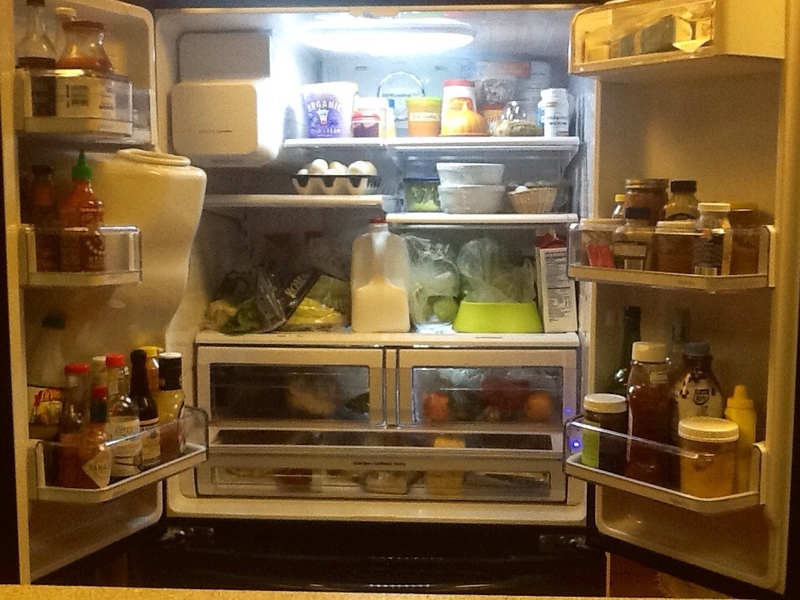 Drop a quick note saying, "I accept your challenge", to let me know I'm not alone in this quest for a clean, organized fridge! You know the best part of tackling a difficult job? I love sitting back and admiring my work! Getting a little more organized and cleaner, one day at a time . . . Over at Julie's!! !